This everyday facial redness kit works together to improve the appearance of red, irritated skin. Start with the Facial Redness Cleanser™ to gently clean and help calm the skin. Follow with the Facial Redness Relief™ to help moisturize and soothe skin. Both products are infused with soothing maximum strength botanicals and Certified Organic Aloe Vera* for healthier looking skin. I have used products prescribed by my dermatologist and didn't get any relief from my Rosacea. 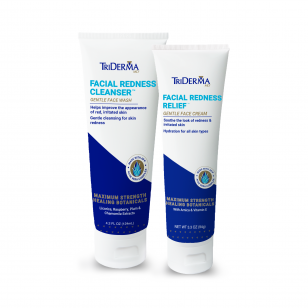 I purchased the TriDerma product from CVS and got instant relief. My face doesn't itch and burn like it did in the past when I used the prescription ointment from the pharmacy. When I went to CVS to purchase more they didn't have it in stock. I went to the TriDerma website and I was so happy that I was able to order both the facial cleanser and cream. I love their products and the fantastic prices. I have suffered from sensitive skin for more than a year. My original skin is oily but after the first reaction with a cosmetic product, my skin gets more and more sensitive and inflamed so easily. In the midst of the second reaction, I found this cream which I bought from Bed Bath and Beyond a long time ago. I read its indication and applied on my face because I was desperate. I saw the result after several applications. The inflammation decreased overnight. I will buy the bundle again. This product is the only thing that works for the redness of my cheeks! Makes my skin calm & less dry. I work in the OR, so I'm always in a cold environment which drys my skin out! So this product is a miracle! I've been suffering from rosacea for years and this cream has saved my life it is so calming and erases my red patches :(. its been about 2 years now of using triderma and so far is the only brand that helps me with the problem. I got their products at Target but I'm glad now that I can buy also directly from vendor. Please bring as soon as possible the other products that are not available right now..it says "coming soon" I would love to try other products of this brand. I started breading out in 2009 during my freshman year of high school. I didn't understand why since I hadn't changed anything that I was using or doing but since then I have been to the dermatologist, tried home remedies, tried almost ever single product out there but when I tried this one I was amazed at how fast and effective it was. My skin has never looked better and I would drive 500 miles just to buy this product. I am amazed how one single kit can change my skin forever!!! Non greasy, absorbs fast, helps reduce the redness in my face. This product really helped with my dryness and redness. Step 1. Facial Redness Cleanser™: Gently apply to wet skin. Massage over face and neck. Water may be added for foaming action. Rinse with water and pat dry. Using twice daily helps improve the appearance of skin prone to redness. Step 2. Facial Redness Relief™: Apply to clean skin morning and night. Recommended for daily care of all skin types. aloe barbadensis (aloe vera) leaf juice*, sodium cocoyl alkyl esters, decyl glucoside, glyceryl stearate, cocamidopropyl betaine, stearic acid, glycol distearate, sodium methyl cocoyl taurate, cetyl alcohol, coco-glucoside, cetyl hydroxyethylcellulose, tetrasodium glutamate diacetate, sodium lauroyl methyl isethionate, fragrance (parfum), chamomilla recutita (matricaria) flower / leaf extract, glyceryl oleate, phenoxyethanol, glycerin, morus nigra (mulberry) extract, glycyrrhiza glabra (licorice) root extract, camellia sinensis leaf extract, butyrospermum parkii (shea) butter, arctostaphylos uva ursi (bearberry) leaf extract, avena sativa (oat) kernel extract, methylisothiazolinone, octyldodecanol, ethylhexylglycerin, sodium palmitoyl proline, nymphaea alba flower (lily) extract, phyllanthus emblica (amla) extract, beeswax, rubus idaeus (raspberry) leaf extract, phoenix dactylifera (date) fruit extract, prunus domestica fruit (plum) oil, citric acid. Facial Redness Relief™: aloe barbadensis (aloe) leaf juice*, dimethyl sulfone, arnica montana (flower) extract, isopropyl palmitate, caprylic/capric triglycerides, cetearyl alcohol, polysorbate 60, beeswax, tocopheryl acetate (vitamin e), c12-c15 alkyl benzoate, allantoin, behentrimonium chloride, cyclopentasiloxane, cyclohexasiloxane, hydroxethylcellulose, sodium hydroxide, phenoxyethanol, ethylhexylglycerin.